Best known for maverick views on federal deficits and the national debt, Eisner (Economics/Northwestern Unviersity; How Real is the Federal Deficit?, not reviewed) makes his signature subjects a centerpiece of this contrarian and somewhat unfashionable audit of the domestic economy. While Eisner stops well short of claiming that budget shortfalls don't matter, he does argue that government figures overstate the case, inter alia, by failing to take economic growth and investment (in education, infrastructure, etc.) into account. Nor, the author complains, do they distinguish between operating outlays and capital expenditures. He goes on to point out that deficit abatement is not an end in itself; the government's principal objective is--or should be--to improve the well-being of the American people. 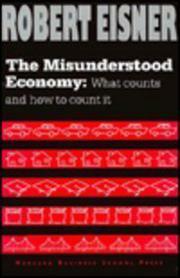 To further his point, Eisner weighs widely used measures of the US economy and finds them wanting. Starting with GNP, he cautions that it's necessary to look beyond official data to get an accurate picture of activities not included in market transactions, e.g., housework, research, and the volunteer services provided nonprofit institutions like museums, schools, and churches. He also discusses investment's links to savings, the realities of America's putatively reprehensible status as a debtor nation, foreign-trade balances, the considerable gains that can accrue from reducing unemployment below its so-called natural rate (above which, many other economists believe, inflation is inevitable), monetary policy, the effect of tax increases, the issue of whether government spending is high enough, and why prosperity (or the lack thereof) could have more to do with the country's capacity to care for the elderly than the condition of Social Security trust funds. An informed and informative guide to the US economy's strengths and weaknesses for those perplexed or offended by the major media's invariably shallow, frequently mistaken interpretations.